October 13, 2014 December 6, 2014 gingerlingUncategorized, Vegan, what do vegans eat? For breakfast I am having marmite and hummus (mixed together!) on toast. 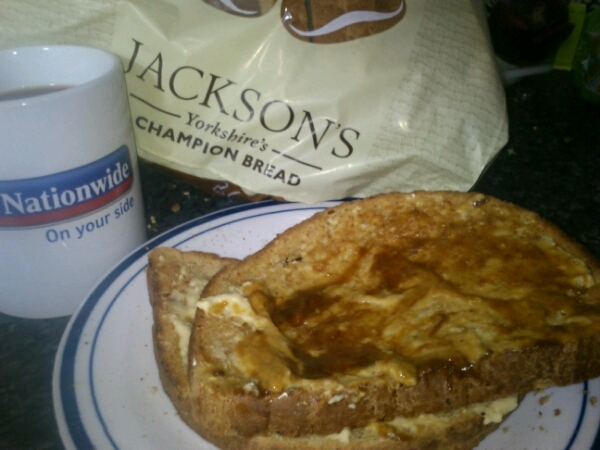 I really love this bread by jacksons too! Also, a black cofee from the coffee exchange in the mum I got free with my nationwide (ethical!) mortgage. Hurrah! What do vegans eat? Vol 10 – #leftoverfest!